This roast chicken recipe is really better described as a technique, as there are only three ingredients used in this authentic Italian method of roasting chicken. I kid you not, if you have an oven and you can fog a mirror, you can do this. 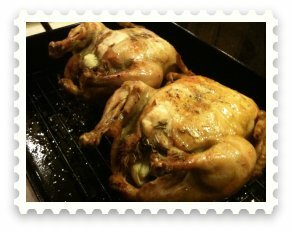 In my opinion, there are two mistakes people make when roasting a chicken, whether you are doing it in your oven or on your grill. Mistake number one, is that they don't place anything in the cavity of the bird. By placing pieces of onion and/or apple within the bird you create a steaming effect on the inside which helps keep the bird moist. Mistake number two, they roast or grill the chicken breast side up. While not conventional, by roasting or grilling breast side down, you substantially reduce the chance of the white meat drying out. The draw back? It doesn't look as good if you present the bird whole, so it's your call. What I did with these birds pictured was roast them breast side down, then turned them breast side up with ten minutes of roasting time left. I think they looked fine. We made a video below that you should watch on "how to roast a chicken." Also, if you have any questions about this recipe or BBQ and/or grilling in general, Click Here. Typically I get back to you with an answer within twenty four hours, typically much sooner. Again, watch the video below. This is really simple. Preheat the oven to 375 degrees Fahrenheit. Rinse the chicken and remove the giblets and neck from inside the bird. Discard, unless you plan on making gravy. Dry off the bird with paper towel. Rub bird down with olive oil and salt and pepper both sides. Rub the garlic and the rosemary inside the cavity of the bird. Then, place some onion and/or apple inside the cavity. You do not eat the onion or the apple. It is there to prevent dryness and to infuse the bird with flavor. Place breast side down on a rack and slide it into the oven. Baste the bird every 15 minutes or so. The bird should be done in an hour or so. The internal temperature of the breast should be around 160 degrees Fahrenheit, and the thigh should be around 175 degrees Fahrenheit. Remove and allow to rest for ten minutes under a sheet of aluminum foil. Carve and enjoy! Also, CLICK HERE if you have a great side dish recipe that you would like to share with us!